Volumetric efficiency testing measures airflow into each cylinder and allows Victor Aviation to match cylinders for maximum power so that the pilot can have the benefit of using all available power uniformly and efficiently with all cylinders. When cylinders arrive at Victor Aviation they are airflow tested to determine their individual flow characteristics. It is quite often found that airflows in new cylinder castings may vary as much as 15%-20% between them, meaning that if installed on an engine they would produce an unbalanced power output. As airflow varies from cylinder to cylinder so does individual cylinder horsepower. This imposes an unequal strain on the engines crankshaft and crankcase, and reduces engine horsepower. An aircraft engine converts fuel energy to rotating motion, which is commonly measured as horsepower. In the engine, gasoline is added to air as it passes through the carburetor (or fuel injectors) on its way to the cylinders. 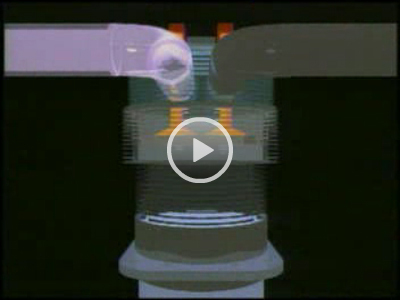 This fuel-air mixture is then ignited by the ignition system, creating enormous heat, which creates high pressure. This pressure then forces the pistons down in the cylinders turning the crankshaft and propeller assemblies. Now imagine that this engine has some type of restricted intake, such as an air filter, carburetor or injector and an intake manifold. With this configuration, the intake manifold has a fairly good vacuum. In this case, even though the piston pulls a volume of 100 cubic inches into the cylinder, it is not atmospheric air. Here you have the 100 cubic inches of the vacuum from the manifold. You can think of this as the opposite of super charging because the cylinder ended up with less fuel and air molecules rather than having more fuel/air packed into the same volume. Volumetric efficiency (VE) is used to describe the amount of fuel/air in the cylinder in relation to regular atmospheric air. If the cylinder is filled with fuel/air at atmospheric pressure, then the engine is said to have 100% volumetric efficiency. On the other hand, superchargers and turbochargers increase the pressure entering the cylinders, giving the engine a volumetric efficiency greater than 100%. However, if the cylinder is pulling in a vacuum, then the engine has less than 100% volumetric efficiency. Normally aspirated engines typically run anywhere between 80% and 100% VE. 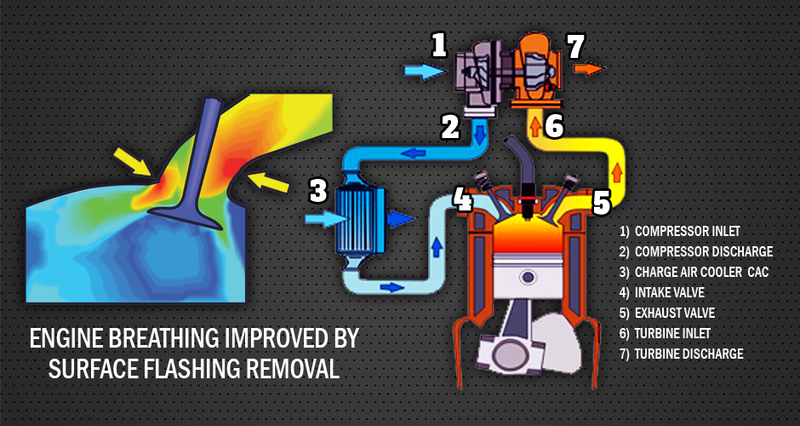 Regardless of whether you have a normally aspirated or turbocharged engine improving the engines Volumetric Efficiency will provide improved power. When an engine is throttled back to a low cruise power setting, engines are starving for air and any improvement in the cylinders Volumetric Efficiency will greatly affect aircraft performance. Customers have often commented that after installing a "Power-By-Victor" engine in their aircraft that they were able to maintain an equivalent “before and after” airspeed WITH LOWER POWER SETTINGS and lower fuel consumption on many models. Volumetric efficiency is also reduced if it is found that the induction system or cylinder intake area has any casting irregularities (surface flashings) that obstruct the smooth flow of air. Using a specially designed Air Flow Test Bench used by Victor Aviation we can detect these abnormalities by simulating a “wind tunnel” for measuring the air entering and exiting the cylinder. By carefully removing any unwanted surface flashings we improve the cylinders Volumetric Efficiency and improve power distribution so that all cylinders will breathe more efficiently. The more fuel/air that gets into the cylinder, the more power the engine will produce and better fuel efficiency is obtained. This FAA Accepted Special Procedure used at Victor Aviation does not reduce the original cylinder port wall thickness or alter the original cylinder design. Only deviations from the original manufacturer’s casting design are removed. By matching the cylinders VE airflow characteristics a better balanced engine airflow is obtained providing for improved acceleration, smoothness, fuel efficiency and power.